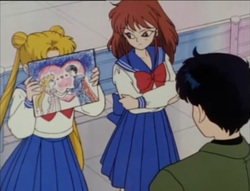 Welcome To The Sailor Moon Photo Gallery! This is the Gallery, the pride and joy of the website. It's going under revamping, so please excuse the fact that there's basically nothing here for now! As part of its new image, I'm separating the pictures so that they are nice and organized. It'll make things easier for everyone! Also, some of the pictures I had to edit logos/subtitles out of, and since I'm artistically challenged they'll stand out. I'll write something about that in the caption, as well as other various notable features regarding pictures in that section of the gallery. Still working on identifying all of them, though. DISCLAIMER: I did not create the images myself, the animators of Sailor Moon did. However, I did take the pictures myself.